The blazing summers bring along a variety of juicy and water-based fruits that are enough to tantalize our taste buds. I’m sure most of you await the arrival of the exotic litchis. They may be small in size, but as they say, ‘big surprises come in small packages’. Did you know that in ancient China, gifting litchi to kings and queens was considered to be a great honor? There are numerous beauty and health benefits of litchi fruit, from aiding weight loss and digestion to treating influenza and reducing the signs of aging. 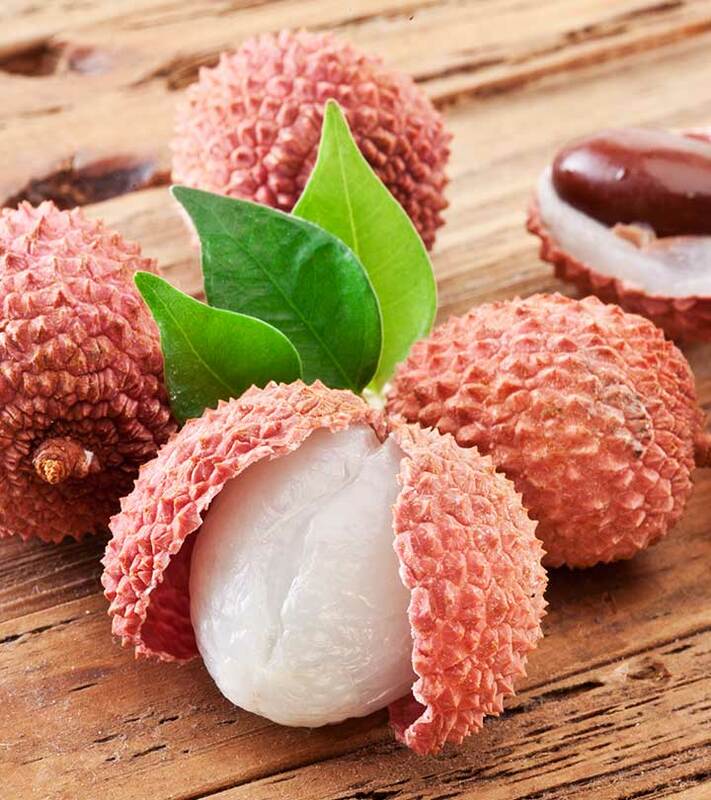 First let us know small brief about what is lychee and are lychees good for you. 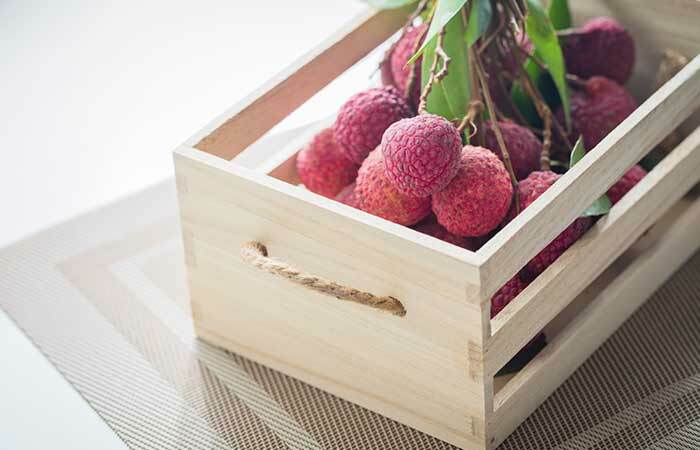 Litchi or lychee is grown in tropical and subtropical regions and is popular all over the world. This flavorful and juicy fruit grows in clusters on a slow-growing medium-sized evergreen tree that bears this fruit for a limited time only. This tree also bears pretty spring flowers that are really short-lived. It has a round or oval shape with a pinkish-brown rind, translucent to white flesh, and an inedible seed. It may have a short shelf life, but this juicy summer treat has more than just taste to offer. 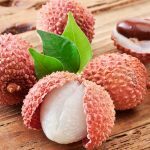 Is lychee healthy? Yes It is highly rich in nutrients and offers numerous benefits for your skin, hair, and health that make it all the more irresistible. Litchis have a high nutritional value. They are very rich in vitamin C, containing about 71.5 mg per 100 grams. They are also rich in copper and phosphorus. What makes litchis unique is that they contain the polyphenol oligonol that has antioxidant and antiviral properties. For a more detailed overview of the nutritional value of litchis, refer to the chart below. Litchis are simply amazing for our skin. Whether you are suffering from ugly wrinkles or dry skin, these exotic fruits have a solution for everything. 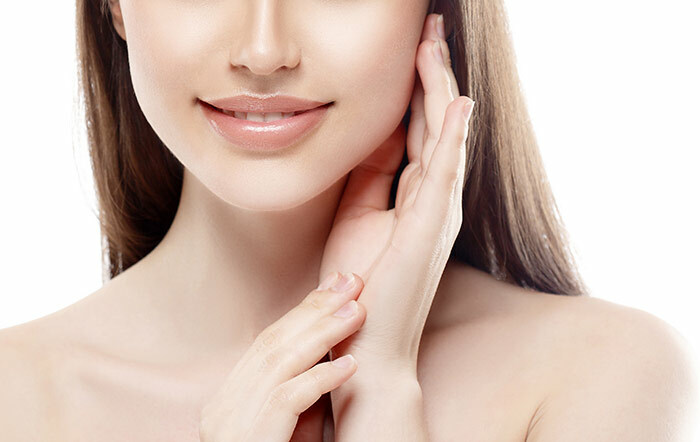 As you grow older, your skin starts to show the first signs of aging. Litchis, when used topically, can help delay their appearance. 1. Mash the banana and litchis. Mix well so that they form a smooth paste. 2. Gently massage the paste on your face and neck using circular motions. 3. Keep the mask on for 15 minutes and rinse with cold water. As you age, your body produces more and more free radicals. These free radicals damage your skin and cause wrinkles. Litchis are rich in antioxidants that combine with the free radicals and prevent them from damaging your skin (1). Blemishes are the bane of anyone who seeks flawless skin. Applying litchi juice can help fade away the blemishes and marks, leaving you with clear skin. 1. Mash the litchis to make a paste. 2. Soak the cotton balls in the paste, and apply to your face or just the affected areas. 3. Keep for 15 minutes, and wipe off with a clean washcloth soaked in cold water. Blemishes are basically spots bearing the signs of hyperpigmentation. Litchis are excellent sources of vitamin C (2). This makes them a potent cure for blemishes (3). Spending too much time in the sun can cause redness and blisters. Sunburns can cause pain and irritation, and applying litchi infused with vitamin E can help soothe your inflamed skin. 1. Extract the juice from the litchi pulp. To do this, you need to mash the pulp and pass it through a strainer. 2. Puncture the vitamin E capsule and add it to the juice. 3. Apply to the affected areas and rinse with cold water after 30 minutes. Litchi is effective for treating sunburns because of its vitamin C content. A combination of vitamins C and E has been proven to treat the effects of the sun on the skin (4). Apart from being a blessing for your skin, litchis also add shine and bounce to your hair. 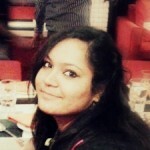 Be it stress or pollution, a host of factors can wreak havoc on our hair. Litchis, when used topically, can help promote hair growth. 1. Mix the litchi juice and aloe vera in a bowl. 2. Massage the mixture into your scalp. 3. Keep it on for 60 minutes, and then wash it off with a mild shampoo. Your hair grows when the hair follicles are properly nourished. Copper peptides enlarge the hair follicles, which drastically reduces the resting phase of hair growth (5). Since litchi is an excellent source of copper, it helps stimulate the hair follicles and makes your hair grow. Is your hair losing its natural shine owing to the harsh weather conditions? 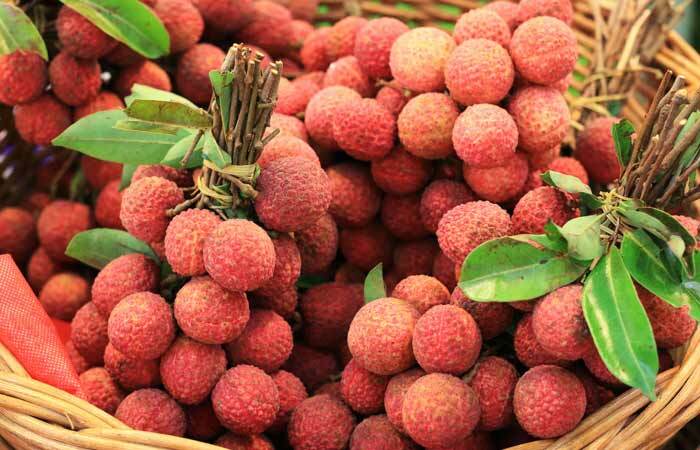 Start using litchi pulp as a conditioner for your hair. 1. Mash 10 litchis to make a pulp and apply this pulp to your hair. 2. Wash thoroughly after 15 minutes to achieve shiny and beautiful hair. Litchi is rich in vitamin C that enables it to refurbish the shine in our hair. It is also full of copper and iron that are responsible for maintaining the original hair color. The exotic and the gorgeous litchi is full of health benefits ranging from aiding weight loss to preventing cancer. Let’s take a look. One of the most important benefits of litchi is that it has anticancer effects. Having it on a daily basis in any form, including litchi juice, can actually help prevent the occurrence of this fatal disease. Research using litchi extracts have shown that they contain powerful antioxidants and flavonoids and have anticancer effects, which are especially effective against breast cancer cells (6). Researches state that the antioxidants present in litchis can help promote cardiovascular health. Litchis contain a compound named oligonol that promotes the production of nitric oxide (7). Nitric oxide or NO is a vasodilator, which means it helps expand the blood vessels to allow blood to flow through properly. This reduces the pressure on your heart to pump blood, reduces the wear and tear your heart goes through, and improves the overall cardiovascular health. If you frequently suffer from constipation or other disorders related to the GI tract, try consuming litchis to ease your digestion. consumed by the Chinese to help with digestion and relieve stomach ailments (8). Litchis have a lot of water content, which has a soothing effect on the stomach. They also have a considerable amount of fiber, which helps in digestion (9). Cataract is a visual impairment that is caused due to the clouding of the lens in the eyes. Since cataract affects millions, there have been numerous studies conducted regarding it. One study concluded that litchis might help inhibit cataract. Litchis contain phytochemicals that exhibit antioxidant and antineoplastic properties. This means that they help prevent abnormal growth of cells, which helps prevent cataract (10). Influenza is caused by viruses and is an extremely communicable disease. Due to certain strains of these viruses showing resistance to traditional antiviral drugs, there is a need to develop new medications. Litchi fruit extracts have shown to be effective against these viruses. Litchis exhibit antiviral properties due to the presence of oligonol that stops the virus from multiplying (11). Being a low-calorie fruit, litchi is ideal for those who are looking to lose weight. Litchis don’t have too many calories, with 100 grams containing only 66 calories (12). They also contain a lot of water, a significant amount of fiber, and have negligible fat content. This makes them ideal for those looking to lose weight. Litchis have been found to help in proper blood circulation throughout our body, thus ensuring smooth functioning of organs and organ systems. The presence of a variety of nutrients, including magnesium, iron, copper, manganese, folate, and vitamin C, plays an important role in making litchis a blessing for our circulatory system (13). Consuming litchis or litchi juice can help in controlling abnormal bruising owing to blood vessel rupture. Litchi is rich in abundant polyphenols like the bioflavonoid called rutin. This makes it a necessity when it comes to the strengthening of the blood vessels (14). This property also makes it useful in treating conditions like varicose veins and hemorrhoids. Including delicious litchis in your diet can help treat inflammation and tissue damage that can happen due to various factors, including vigorous exercise. It has been found out that flavanol-rich litchi fruit extracts (FRLFE) possess anti-inflammatory properties (15). Having litchis in the morning can provide the much-needed kick start to your day. Litchi is rich in vitamin C, which serves a number of important functions in the body including being an important co-factor in all enzymatic reactions. It plays an essential role in the production of collagen and carnitine that are required to break down fat, providing us with instant energy (16). Litchis can also protect us from the deadly herpes virus. This wonderful fruit has proanthocyanidins that carry very powerful antiviral properties. These properties make it effective against rare and troublesome viruses like herpes or coxsackie (17). Does a slight weather change make you prone to cold and cough? It’s quite possible that you have a weak immunity. Have litchis to strengthen your immunity. The presence of vitamin C in litchi makes it very effective in strengthening our immunity (18). This water-soluble vitamin is full of antioxidants that protect our body from foreign germ invasion. Hence, it is a highly recommended fruit for young kids. We generally avoid pulpy fruit to maintain blood pressure. However, litchi is amazing if you want to get your blood pressure under control. Litchis carry balanced potassium and sodium levels, which is absolutely necessary for maintaining proper blood pressure. Also, the vasodilatory properties of potassium enable it to soothe and relax the blood vessels in the body, leading to the controlled hypertension (19). Consuming litchis regularly can make your bones stronger. Litchis are full of essential compounds required for healthy bones, such as magnesium, phosphorus, manganese, copper, iron and many others. These minerals actually increase the calcium absorption in the bones, thus making them healthy. Litchis play an important part when it comes to the prevention of anemia. This fruit contains an essential amount of copper, which increases the RBC count in the blood. We all know that anemia occurs due to decrease in the hemoglobin levels. This can be avoided by consuming litchis (20). Many studies have concluded that litchi can enhance sexual desires in humans. Litchi is known to stimulate the libido because of the abundance of important components like potassium, copper, and vitamin C (21). Litchis have high sugar content, which is why people suffering from diabetes should have them in moderation. They might cause allergic reactions in some people. So, if you have had some history with it, you should totally avoid consuming litchis. Litchi is also known to disturb the hormonal balance in the body. So, consume it in moderation as it can cause internal bleeding, fever or many other troubles. Pregnant ladies should avoid having litchis until they are in the breastfeeding stage as they can cause hemorrhage and infections and harm your baby. Litchis are mostly grown in tropical and sub-tropical regions. They are seasonal fruits, and are usually available from June through October. They are highly perishable, and once plucked from the tree, do not ripen any further. A pinkish-brown shell indicates that the fruit is fresh. Select litchis that are firm, feel heavy, and have a dry shell. Avoid the ones that feel soft, or have cracked shell or black spots. Litchis don’t have a long shelf life. When stored in the refrigerator in a plastic bag, they can last about 10 days. Refrigeration usually turns the shell of the litchi darker without affecting the fruit. 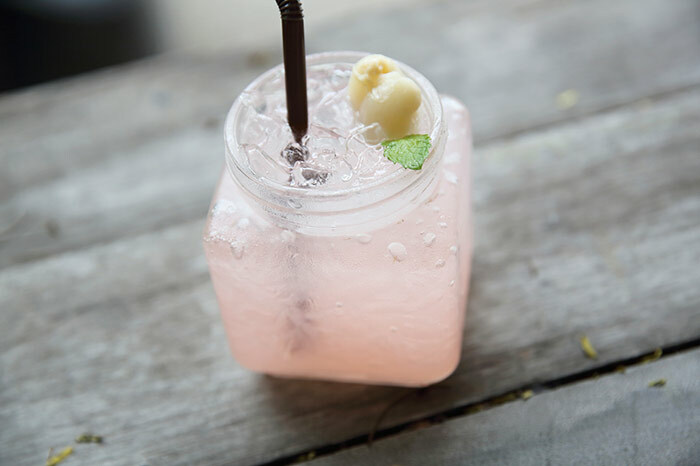 Make a refreshing summer drink by adding litchi to the classic lemonade. 1. Blend the litchis till a puree is formed. 2. Add the rest of the ingredients and blend or use a shaker to combine. 3. Serve in a tall glass with ice cubes. Who doesn’t love pudding? Here’s a quick recipe to make yummy litchi pudding. 1. Mix the custard powder in a little milk. Now, add this thick paste to rest of the milk and let it boil. Make sure the consistency is thick. 2. Soak gelatin in a dash of water and add this to the custard. Mix well. Now, add milkmaid and stir properly. Let the mix cool for some time. 3. Take another bowl and whisk the cream in it and pour it in the custard. Add pomegranate and litchi and refrigerate it for two to three hours. 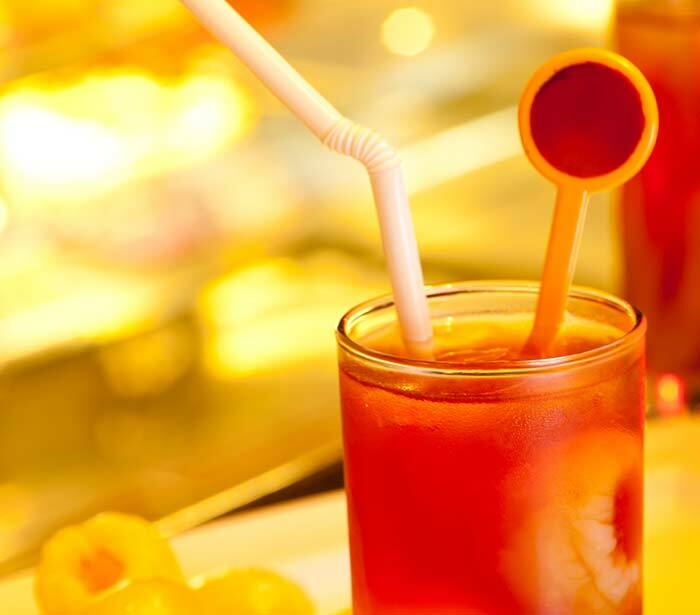 Here’s a recipe for litchi iced tea to quench your thirst. 2. Add tea leaves and cover it for 20 minutes. You can add more tea if you like your tea strong. 3. Let the mix cool for half an hour and then strain it. Add litchi crush and sugar to it. You can increase or decrease the quantities of sugar and crush according to your taste. 4. Take a glass and fill it with ice cubes. Now, pour the litchi tea over it and serve chilled. Usually, litchis are eaten with their shell and seed removed. Their sweet taste makes them a great addition to smoothies, salads, and desserts. 1. Peeled and chopped litchis can be served on a cheese platter. 2. 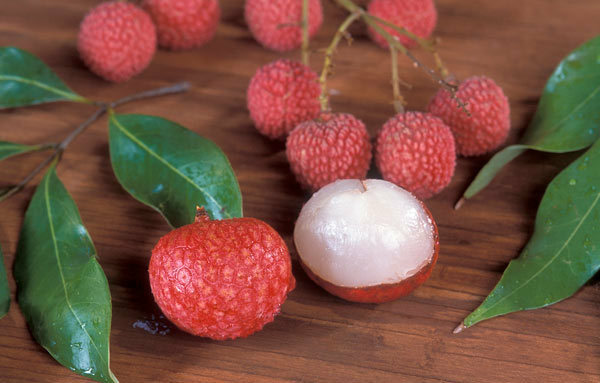 Litchis can be added to ice cream, custard, and yogurt and served as dessert. 3. They can be dried with the rind intact so that the pulp shrinks. Dried litchis are also known as litchi nuts. Litchi fruits are so delicious that people don’t need to be prompted to include it in their diets.